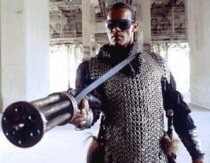 This boring and dreary martial arts affair about good and evil Cyborgs battling it out in a Mad Max-like post-apocalyptic landscape is something that Jean Claude Van Damme would probably rather have consigned to the dust heap out of pure embarrassment. Instead it's been relegated to the great video shelf dust heap. Largely plotless and cheaply made. Also, for some reason characters in the movie are named after electric guitars, for example Van Damme's character is named "Gibson Rickenbacker" . . .